Perhaps the strangest thing about this camera is the name. 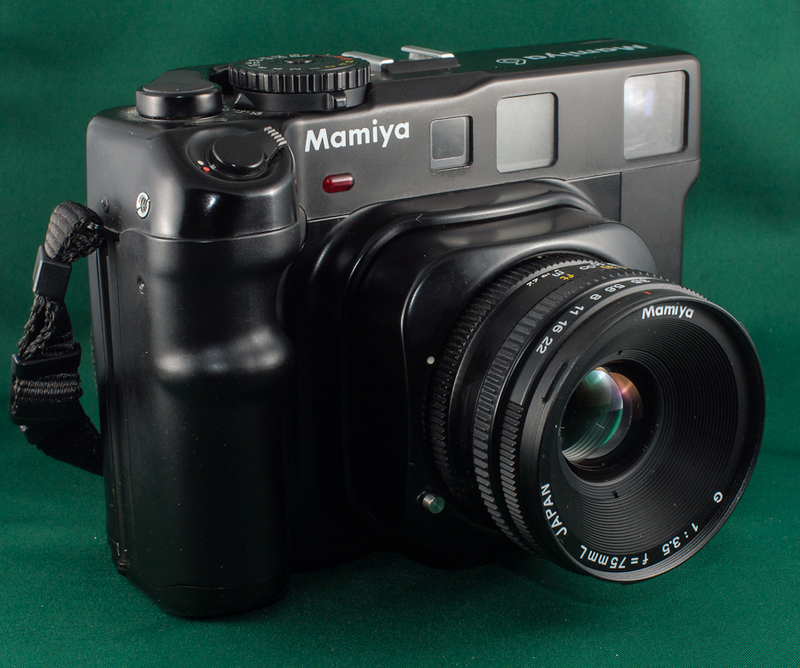 Thirty years separate the discontinuation of the original Mamiya 6 and the camera pictured above. Apparently the folks at Mamiya just couldn’t think of an original name for their new camera so they decided to call it…… the Mamiya 6! How brilliant is that!? 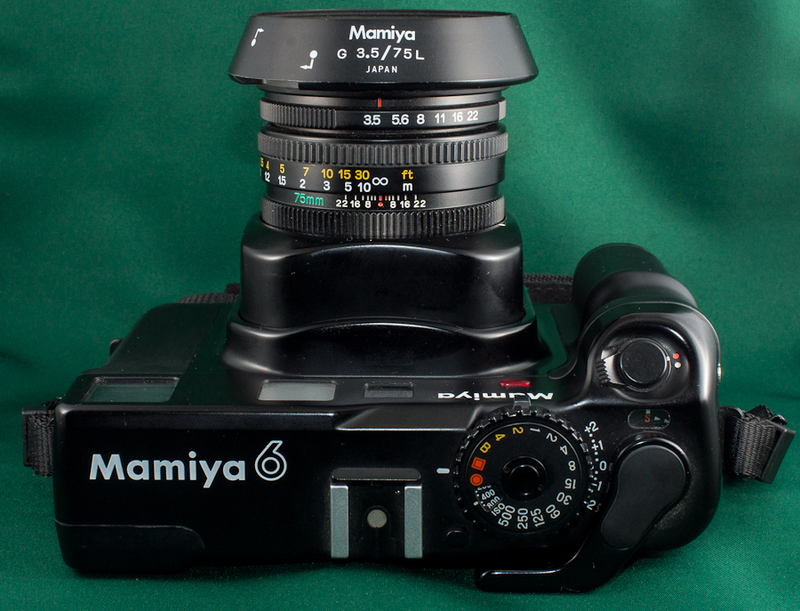 The strange part is that it has very little in common with the original Mamiya 6. After all, thirty years is a pretty long time, especially when you are talking about that particular thirty year span (1959-1989) in the nation of Japan. I lived in Japan through most of that period and can assure you that the changes were immense. So I guess it’s no surprise that the Mamiya 6 released in 1989 looks completely different from the Mamiya 6 of the 1940s and 1950s. The things they have in common are that they are both medium format rangefinders that produce a 6×6 frame and they both have leaf shutters and collapsible bellows. Beyond that they are two very different animals. The original 6 is a folder while the new 6 allows the lens to partially collapse into the body but without the clam-shell design of a folder. The original 6 has a fixed lens while the new 6 uses exchangeable lenses. The original 6 has a unique focusing system that moves the entire focal plane (i.e. the film itself) backward and forward to attain focus and is controlled by a thumb wheel on the back side of the body. The new 6 has a conventional in-lens focusing system controlled by a focus ring on the lens. The original 6 is all manual (like just about every other camera back then) and thus is 100% mechanical requiring no batteries. The new 6 has an electronic shutter and built in metering system allowing operation in AE (aperture priority), AEL and metered manual modes. In the original 6 the film advances from right to left, driven by a thumb dial on the top left. In the new 6 it advances from left to right, powered by a lever on the top right. So what’s the big deal about the New Mamiya 6? Well, many people still insist it is one of the best medium format rangefinders ever made, even though it was released over twenty years ago. It is very compact and portable by medium format standards. Having exchangeable lenses sets it apart from the many highly acclaimed Fuji rangefinders (except for their very first models released way back in the late 1960s) The glass is considered top notch. And this machine simply excels at taking photos. It was followed by the Mamiya 6MF (multi-format), then the Mamiya 7 (6×7) and the current model Mamiya 7II. The later models are easier to find on the used market but the Mamiya 6 can be rather hard to find. I looked for several months before finding this one. I guess folks don’t like to let these go once they get their hands on one. There are only three lenses for this camera; the 50mm f/4, the 75mm f/3.5 and the 150mm f/4.5. My camera came with the standard 75mm lens which has an mfd of 1 meter and goes from f/3.5 to f/22. The aperture ring has indents at 1 stop intervals but the aperture can be set anywhere in between as well. Even though this is a lens shutter, the shutter speed is set via a very large, but otherwise conventional looking dial on the camera body. 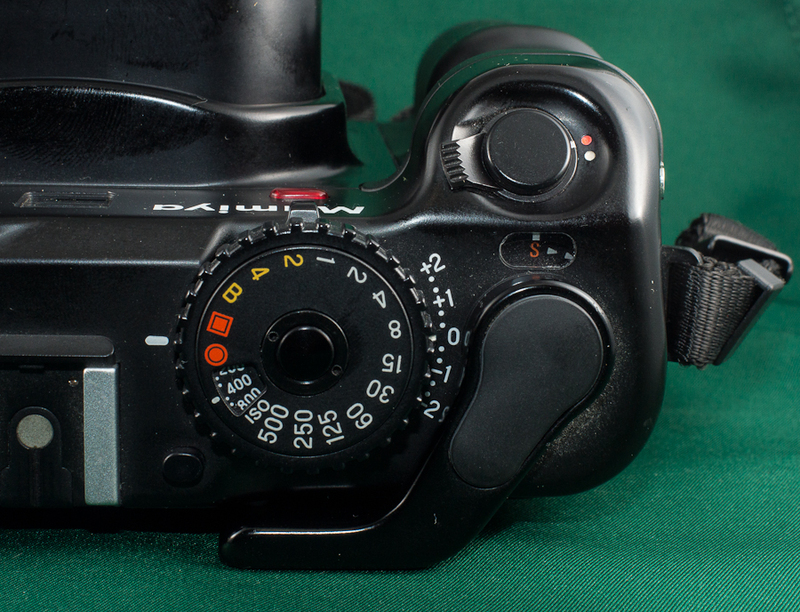 Shutter speeds go from 1/500 down to 4 seconds and bulb and cannot be set between the marked speeds. Exposure modes include AE, AEL and metered manual modes and are selected on the same dial as shutter speed. EV comp goes from +2 to -2 in 1/3 stop increments and is accessible from the same dial, as is ISO, which can be set from 25 to 1600. There is a 10 second self timer, a hot shoe and a flash sync cable socket. The shutter release takes a standard threaded release cable although it screws into the side of the body rather than into the release button itself. There is a built in dark slide for use when changing lenses while film is loaded. It is operated by dial and release switch, both on the bottom of the camera. The new 6 features three neck strap lugs allowing the user to hang the camera horizontally or vertically. The viewfinder is relatively bright and easy to use. Focusing with the rangefinder is quick and easy as well. So I guess the question is, what in the world am I doing buying a distinctly expensive camera like this when most of the cameras featured on this site were dirt cheap? Well, ever since getting into B&W film I have started doing a lot more handheld photography with my medium format cameras. For landscape work I still prefer the big SLR type cameras on a sturdy tripod with color reversal film, but when it comes to handholding, rangefinders are hard to beat. And so I’ve had a growing interest in these light and compact cameras. Unfortunately they are generally way too expensive for my budget. But then I did some creative financing with a birthday present and selling several other cameras that weren’t getting much use and was able to get the Fuji GS645 and the Fuji GF670. Then I kept looking through my camera collection and realized that keeping cameras I don’t use doesn’t make much sense. So when I saw this Mamiya 6 for sale at a good price I packed up my Wista 45n large format camera and the Nikon F3 and headed to the store. After all was said and done they took my unused 4×5 and 35mm cameras (and lenses), gave me the Mamiya 6 and even gave me about $100 back in cash! Add to that the fact that I bought the 4×5 with profits from one of those dream deals where I found two beat up gem lenses in the junk pile and sold them for about 30 times what I paid for them, and the fact that the F3 was given to me for free!!! and I’m feeling extremely fortunate to say the least! Visit my gallery to see some photos taken with this camera. I really wanted the wide angle lens so I dug through my closets and scraped together a few more things to sell including my beloved Minolta Alpha 9. I think I will miss that camera. But it just doesn’t get used enough so off it went. The 50/4 wide angle lens has a 75 degree angle of view, making it the equivalent of a 28mm lens on a 35mm camera. Actually I sort of hate those obligatory “35mm equivalency” comments. For one thing I would guess that there are just as many or perhaps even more people who have never used a 35mm camera than those who have. Yes, I know, I know. If you’re a “serious” photographer then you obviously spent years and years shooting 35mm and know it like the back of your hand. Well, to be honest those folks are getting pretty old. I didn’t really get interested in photography until about ten years ago and started with digital. Thus 35mm has never been my primary format. Secondly, this lens is used on the Mamiya 6 which is a square format. And believe me, 75 degrees both horizontally and vertically looks completely different than the 35mm format view of 75 degrees horizontal and only 50 degrees vertically. So honestly, who cares what the 35mm equivalent is! Actually it might even be more helpful if I gave the APS-C equivalent since that is a much more familiar format for lots and lots of photographers these days. For what it’s worth, the APS-C equivalent is 16mm (if you’re talking about horizontal angle of view). Okay, done with that rant! This lens goes steplessly from f/4 to f/22 with indents on one step increments. It looks very similar to the 75/3.5 standard lens. The rings and markings are similar in size and color but the barrel extends an additional 12mm (half an inch) towards the front and the front element is quite close to the barrel unlike the recessed front element of the standard lens. I should probably get a protective filter for this lens. Fortunately both of these lenses have a 58mm filter size. The 150/4.5 tele lens, on the other hand, takes a 67mm filter. The mfd of the 50/4 is one meter, just like the standard lens. That isn’t an issue if all I’m shooting is landscape and architecture, but sometimes a close up wide angle view can be nice so in a perfect world I guess I would wish for a shorter mfd. Oh well! I purchased the third and final lens for this camera, the 150mm f/4.5 tele about one month after buying the camera. So now the kit is complete. The 150mm lens goes from f/4.5 to f32 and the mfd is 1.8m, which once again is a bit longer than I would like. It also differs from the other two in that it takes a screw-in hood that is likely to get lost at some point because it can’t be stored on the lens. The lens is about 1 inch longer than the 50/4 but still very compact and well balanced for this body. Here are some links to other reviews of this camera in case you are looking for more info. Got the 50/4 wide angle lens!